Anyone that knows me, knows that I LOVE soup! Being of Thai and Filipina decent, it’s no surprise that I enjoy a steaming bowl of noodle soup more than any other treat. There’s nothing more comforting or appetizing to me than soup. No matter what the temperature is outside, I always crave a delicious meal in a bowl, from a delicate bowl of miso, hearty minestrone, spicy tom yum goong, or one of my personal favorites, Vietnamese pho. 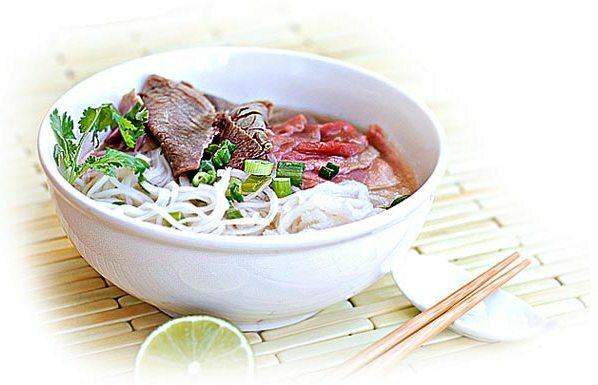 Pronounced “fuh,” pho is a traditional Vietnamese soup that is served with either chicken or beef stock. Rice noodles and your choice of protein follow, then it’s condiments galore! Top it with an array of fresh bean sprouts, aromatic basil, jalapeño slices, and a squeeze of lime, and you’re immediately transported to the street markets of Vietnam. Pho Show is located on an unassuming block of Sepulveda Boulevard in Culver City. When driving by, it’s hard not to notice the catchy name on the large, outdoor sign. Upon entering however, the restaurant is surprisingly unintimidating, which is a rarity for most of the other ethnically diverse noodle shops in Los Angeles. The dining room is simple and modern with clean table tops and relatively comfortable plastic chairs. There’s also an enclosed patio if you’re in the mood to dine al fresco. There is no doubt that Pho Show has a vast menu. With a majority of the menu items in Vietnamese, there’s no need for first timers to worry. Detailed descriptions in English are right alongside. From Cha Gio (fried egg rolls with pork), Bun Bo Nuong (vermicelli noodles with charbroiled beef), to Indochine dishes such as Orange Chicken and Kung Pao Tofu, there is something for every palette at Pho Show. I like to start with the Goi Cuon Tom (fresh spring rolls with shrimp), which are light, tasty and a great introduction to the flavors of Vietnam. Then, I would recommend a small (or large if you are REALLY hungry) bowl of the Pho Ga, the famous rice noodle soup with tender pieces of chicken breast, delicate white onions, and loads of fragrant basil. I top my pho with a heaping pile of fresh bean sprouts, jalapenos, and a few spoonfuls of chili sauce. Note….I like it hot, and the combination of jalapenos and chili sauce is deadly, but so delicious! Finally, you cannot have a complete Pho Show experience without having the Iced Vietnamese Coffee. Most Vietnamese restaurants go the whole nine yards and serve this drink in the traditional drip filter, which is a time consuming process. Pho Show cuts the time in half by preparing the coffee in the kitchen. A satisfyingly sweet and bold dose of caffeine, Vietnamese coffee is a definite must try. Pho Show is a great ethnic eatery on the Westside of Los Angeles. Not only is the food delicious and the portions substantial, but the prices cannot be beat! Nothing on the menu is over $10, which is music to my hungry ears when I’m craving some of my favorite pho!